As the CFL’s Saskatchewan Roughriders continue their training camp at Griffiths Stadium, the team is a definite presence on campus, staying in College Quarter and dining at Marquis Hall every day. So, how do you feed a professional football team? 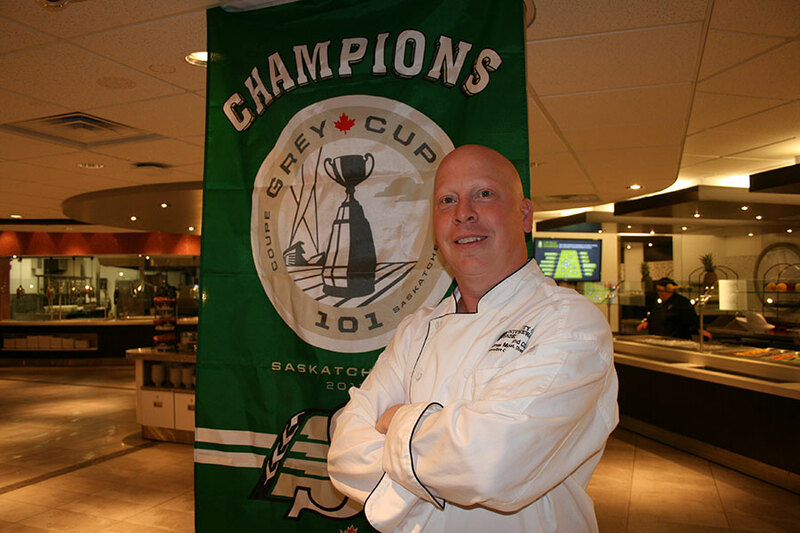 James McFarland, executive chef and assistant director of Culinary Services at the U of S, explained that feeding almost 100 brawny athletes isn't too different from feeding student diners. Preparedness is key to ensure full stomachs and peak performance. "We do prepare more," he said. "There are some guys who do eat a little bit more." Consumption also depends on what stage of training camp is at, as players tend to eat a bit more at the start, noted McFarland. "You can definitely see how the flow of training camp affects them." Themed supper nights planned in advance for the team always go over well. In particular, the Cajun night is a big hit, he said, and has become somewhat of a training camp tradition. This year's Cajun feast included New Orleans-style rice, alligator bites ("It was a novelty item, but they really liked it. "), honey-pecan chicken, blackened catfish, voodoo ribs and Po boy sandwiches, to name but a few dishes. "The players were coming back for seconds and thirds. The guys were pretty excited about the menu." The menu rotates each day so McFarland hasn't noticed any favourites or staples with the team but as athletes at the top of their game, the players maintain a generally healthy diet: lots of protein and meat, plenty of vegetables, minimal carbohydrates, and water, milk and juice rather than carbonated beverages. The turnout for breakfast at Marquis Hall seems low, said McFarland, but that may be because the players make protein shakes in their residence rooms. Meanwhile, student and staff diners seem to be unfazed by the presence of the Roughriders in the dining hall. "It's not that obvious," he said. "People are pretty subtle about it." To see the entire Rider Training Camp schedule, click here.